What are the differences between Tokai LS160 and LS260. Going by specifications, the only differences are capacitors and tops (LS160 is plain top while LS260 is flame). I reckon the woods used might be different, even though they are same on paper). So I wonder if anyone knows exactly what is different? Blindfolded you wouldn't know which guitar you're playing. When you take the blindfold off you'd see the 260 was a flametop. Everything is identical, the necks are the same, the same woods, hardware, etc...the 260 might have Sprague Black Beauties and the 160 Orange Drops (irrelevant). Only when you get to LS360 does the Mahogany become Honduras and the Rosewood Madagascar instead of Indian. In any event the Rosewood days are slowly coming to an end, I order all my LS models with Ebony fretboards these days to avoid CITES Export & Import rosewood permits. Is flamed maple actually so expensive? That's an LS98 difference between those two . Is flamed maple actually so expensive? It's rare and forms only under certain growth conditions. Using a solid chunk of it costs a lot more than using a paper-thin veneer. Is it just me, or are Tokai flamed maple tops not as hot as the ones on Gibson R9? Do Tokai make guitats with ebony fretboards? Is it just me, or are Tokai flamed mapke tops not as hot as the ones on Gibson R9? That's a matter of opinion. In the mid-range models Tokai use sycamore veneers rather than maple so they do look a little different. No complaints about mine! Tokai used to make LS200's with an ebony fretboard and I believe some of the high end LP Custom models have (or had) them as well. Diamond, how do you feel about the 'baked maple' trend? It's another avenue to explore and the results are looking better all the time. In the mid-range models Tokai use sycamore veneers rather than maple so they do look a little different. Would LS260 from 2011 be considered mid-range and use sycamore veneer? I actually prefer plaintops, but a Gibson R anything is way out of my pricerange here in Canada, hell a Gibson Standard is even used. I had to settle for a used 2005 LS-150 with a solid flame maple top. It has grown on me. I'd personally like to see more non book matched flame maple tops. Everything from LS160 up has a solid maple top, either plain or flamed maple...they're called Premium Series models. A 2011 LS260 is about as high end as any LP made by any company/brand in the world. Having said that, some guitarists (cork sniffers) like to spend an extra $3000 on a heavily flamed piece of maple top with a made in Taiwan Nashville bridge and chambered mahogany body thinking somehow they're getting a better LP, they're not. Don't get too caught up in the entry level vs mid range vs high end discussion, it's a rabbit hole...it's like spending 5 years trying different tubes and speakers in your tube amp and 5 years later realizing if you had spent more time practicing your amp would sound better. My favourite Tokai model is the Vintage Series "entry level" LS90/95/110 solid maple plain top, the cheapest made in Japan model. 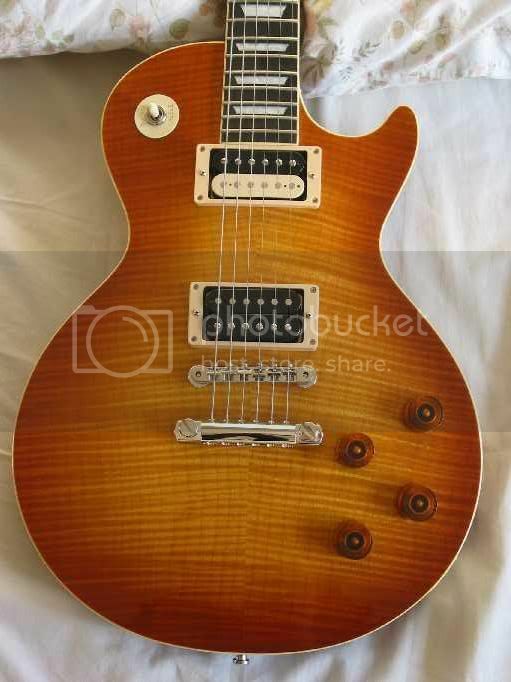 Change the pickups to MK2s if it came with MK3s and change the toggle switch to a Switchcraft and it's the perfect LP...IMO. Do yourself a favour if you get a chance, take this guitar into a music store and play it side by side with a GLP Standard or even a R8 or R9. I've done it, dozens upon dozens of times...the result is always the same. I've actually played dozens of Gibson LP's, and i've never had one stack up to my Tokai. Call me a fan boy, but in today's age you don't need to spend crazy amounts of money to get a crazy good guitar, i don't care what it says on the headstock. A New Gibson R9 will run you around $8000 where i live. I can live without nibs. it's like spending 5 years trying different tubes and speakers in your tube amp and 5 years later realizing if you had spent more time practicing your amp would sound better. But I loved the fiddle-back tops Bacchus put on their flame maple classics a few years back.